I am a total kid at heart when it comes to Rice Krispies treats. 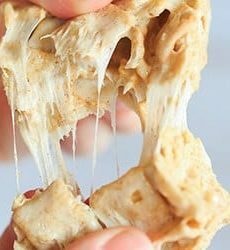 I’ve always loved the gooey, crispy treats and never turn them down if I have the opportunity to eat one. Recently, I had lunch at Noodles & Company where I always, always get one of their enormous snickerdoodle cookies. Last week, however, I was lured away from the snickerdoodle by the massive Rice Krispies treats that were stacked right next to the cookies. Getting a Rice Krispies treat that day was a very good decision. Ever since then, I’ve been craving more and since it’s not exactly convenient to pop into Noodles everyday, I decided to make a batch at home; it has been a few months since my Snickers Rice Krispies Treats, after all. With the holiday weekend approaching, I wanted to make a flavor combination that celebrated summer. 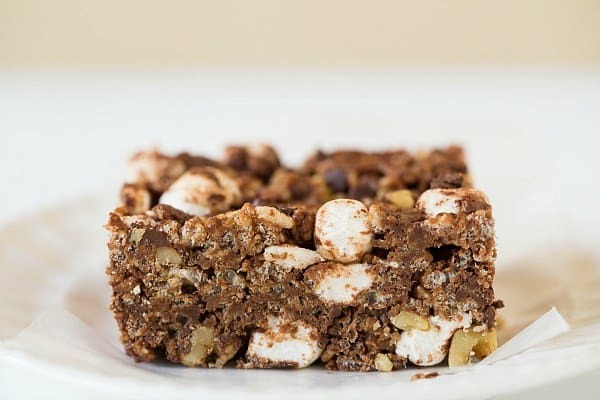 Rocky road is a quintessential ice cream flavor and, as it turns out, it makes for one heck of a Rice Krispies treat! I fashioned these treats after the rocky road ice cream concoction from Marble Slab Creamery, which featured a dark chocolate ice cream mixed together with miniature marshmallows, mini chocolate chips and chopped walnuts. 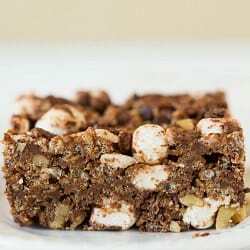 To make the Rice Krispies treats, I added Dutch-process cocoa powder to the butter and marshmallow mixture, along with some almond butter, since almonds are traditionally used in rocky road ice cream. To the mixture, I threw in more (unmelted) mini marshmallows, miniature chocolate chips and chopped walnuts. You could play around with whatever you’d like – different nut butters, different types of nuts, etc. If you’re hosting or going to a Memorial Day party, these would be a perfect easy snack. 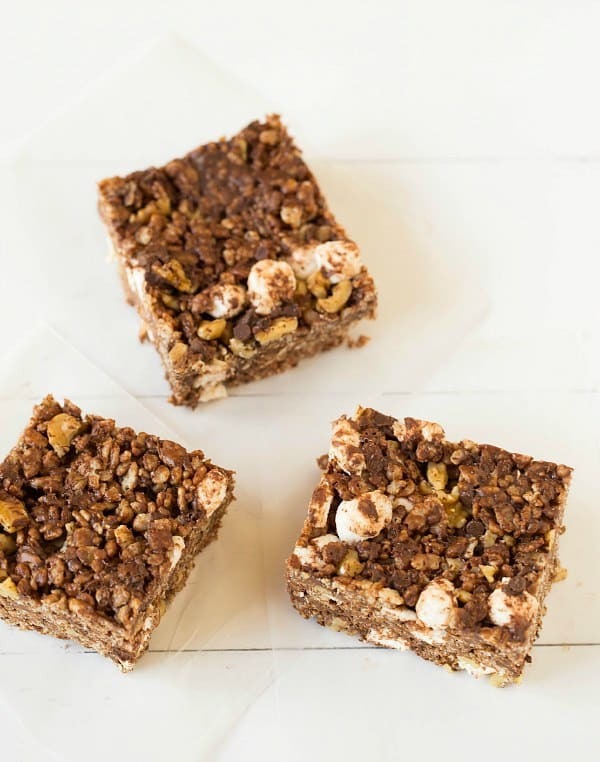 Really, Rice Krispies treats are good anytime of year, for any occasion! 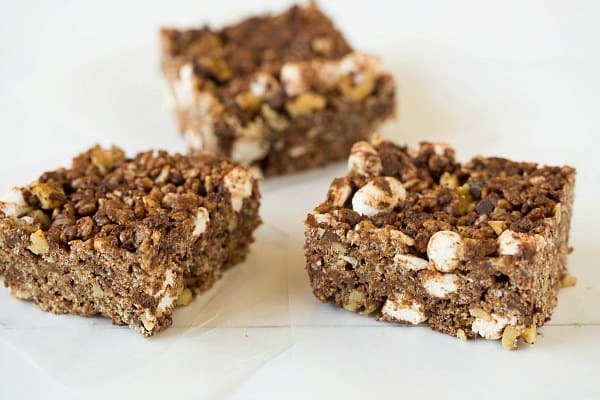 Rice Krispies Treats are always a crowd favorite; this version highlights the best parts of rocky road ice cream - nuts, more marshmallows, and chocolate chips! Melt the butter, the bag of marshmallows and cocoa powder together in a medium saucepan over low heat. Once melted, stir in the almond butter and remove from the heat. 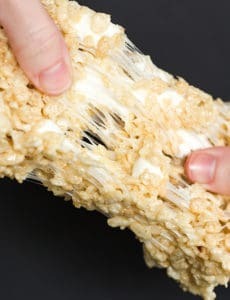 Stir in the Rice Krispies until they are evenly coated with the sauce. Working quickly, stir in the remaining 2 cups marshmallows, walnuts and mini chocolate chips, mixing as gently as possible. Hi Michelle! WOW! This looks delicious. The almond butter must really add some extra flavour. Unfortunately, it’s not that easy finding Almond butter where I live. Do you have any suggestions on what could make a good substitute? Hi Chris, You could use any type of nut butter (including peanut butter). Enjoy! 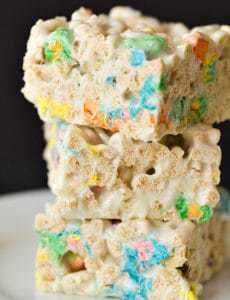 Made these tonight as a surprise treat for my husband, he loves RIce Krispy Treats. And they were the first time my son has ever had them:) and yes, a total hit:) thank you! I actually ended up making my own almond butter which is not hard if you have a bag of almonds and a food processor.